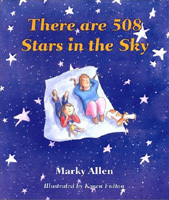 There are 508 Stars in the Sky Book is authored by Marky Allen and illustrated by Karen Fulton. The paperback book is 9.5 x 8 inches with 24 pages. There are 508 Stars in the Sky Book is a fun and delightful story of two little girls who set out on a backyard adventure to answer one of natures great wonders: How many stars are in the sky? Jane and her cousin Madison are two young girls who embark on a backyard adventure as they try to answer the night sky’s greatest challenge — numbering the stars in the sky. Karen Fulton’s artwork fully complements Marky Allen’s gentle and entertaining picturebook story. There Are 508 Stars In The Sky is enthusiastically recommended reading for any child who has ever gazed with wonder at the stars in the heavens and wondered the same thing as Jane and Madison!